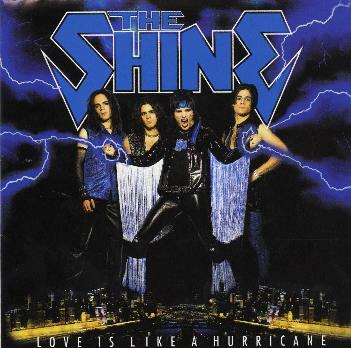 The Shine - "Love is Like a Hurricane"
The Shine are an Australian band from Melbourne who live and breath the likes of band like Kiss, Guns and Roses, AC/DC, and play straight up no frills rock and roll, complete with the hair, the make up and the attitude. This is a 5 track EP. The bands previous release was another EP in 2004. The band has been around since the early 90's releasing a number of demos. Anyway, the CD opens with probably the singer at a drive up fast food place ordering up some rock and roll before the band blasts into "Heavy Gretal". Very much 80's heavy metal rock and roll. "Dying to be Touched" slows it down a bit and has a decent guitar riff. "Girls Were Made to Love and Kiss" is a very KISS inspired track, including the Paul Stanley like vocals on some parts. Gene would like the lyrical content as well. "Every Inch" is a slow, long 7 ½ minute ballad and by far the best song on the CD. The CD ends with "Nitro" (18 minutes), a kind of joke of a 3 minute track with a wild guitar solo (no other instruments) and not much else going on and then you have nearly 10 minutes of silence and then suddenly a guy starts singing, "I'ma gonna go to hell when I die" over and over and over with a guy hitting two sticks together or something and this is repeated over and over for 5 minutes. Pretty pointless. Nothing original here but straight up good time party rock and roll for the bars of Australia, but probably not Copenhagen! For more information you can visit The Shine web site at: http://www.theshine.com.au.